On Saturday, in the wake of a tape of Donald Trump boasting about his repeated sexual assaults, the Republican Party appeared to be in the early stages of a full jailbreak repudiation of its nominee. Early Sunday, Trump struck back, calling his intra-party critics “hypocrites” who would lose elections. And then, at Sunday night’s debate, Trump revealed what may actually have been the result of a conscious strategy: He used the forum to demonstrate to the party that he, and not they, represents their base. Trump began the debate by denying that what was plainly bragging about sexual assault was anything of the sort. It was “locker room talk,” he repeated, as if boasting of misdeeds in the company of other men makes them innocent. Then he pivoted to “real” problems in the world, such as, “Other nations taking our jobs and taking our wealth, and that’s what I want to talk about.” This signaled to conservatives that they should care more about having a president who agrees with them than that president’s character (which, to be fair, is a position many liberals have also taken in the past). Other than his unique fantasy that he opposed the Iraq war, Trump used the debate to vividly depict the fantasy world which most Republicans inhabit. He claimed Clinton deleted her emails illegally and promised that, if he were elected, he would use the powers of his presidency to have her jailed, despite the conclusion by a Republican FBI director that doing so would not be a proper application of the law. 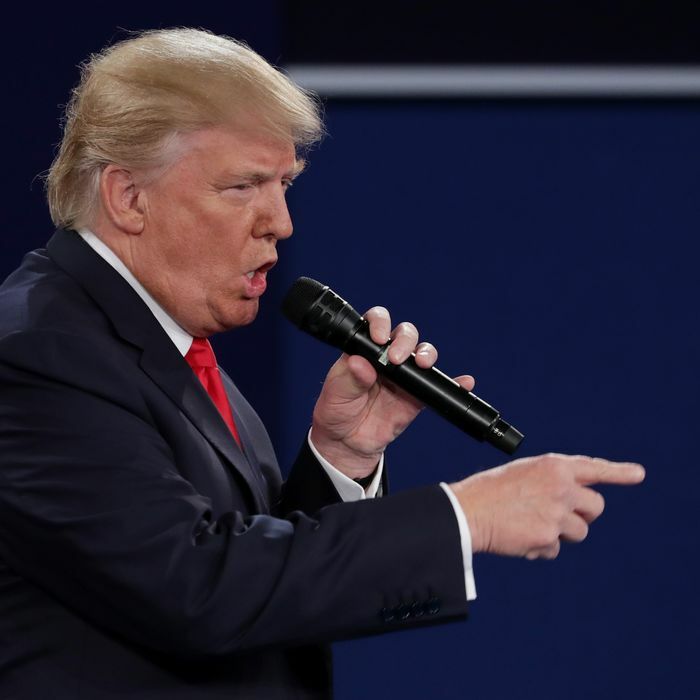 He repeatedly attacked the debate moderators for imagined sins, including allegedly failing to bring up the email issue, which in fact they had. He spouted the usual gibberish about Obamacare driving costs out of control — in fact, health-care inflation has fallen to historic lows — combined with promises to repeal it and replace it with the standard gibberish. Asked a question about the vulnerabilities of Muslim-Americans, Trump demonstrated the problem he was being asked to alleviate, blaming them for allegedly refusing to turn in radicals. (“In San Bernardino, many people saw the bombs all over the apartment.”) This is not true. He likewise repeated the oft-stated Republican belief that the failure to say the exact words “radical Islamic terrorism” is the central problem with American counterterrorist policy. He dodged questions about his promises to ban all Muslim immigration, standing by his recent rhetorical gambit of relabeling the policy “extreme vetting” without rescinding it. He not only denied that Russia had orchestrated hacks on his opponent — a position at odds with the intelligence community — he astonishingly said, “Maybe there is no hacking.” He boiled his environmental stance down to the phrase “clean coal,” a propagandistic term invented by industry lobbyists. In reality, coal-based energy is extremely dirty. It is technically possible to build coal plants that capture carbon-dioxide emissions, but they are prohibitively expensive in comparison with any other clean-energy technology. And he went out of his way to lambaste President Obama. In all these ways, though, Trump remained well within the bounds of modern conservatism. Trump’s central premise was that none of his sins could compare with those of Bill and Hillary Clinton, who are criminals on a historic scale. To Republicans whose beliefs have been shaped through exposure to the Drudge Report, Breitbart, Fox News, or Rush Limbaugh, every word that escaped his lips was simple truth. Hillary Clinton cited the Republican officials who have called him unfit for office, trying to use the prestige of the Republican Party against him. Trump used his time to show that he is the Republican Party.